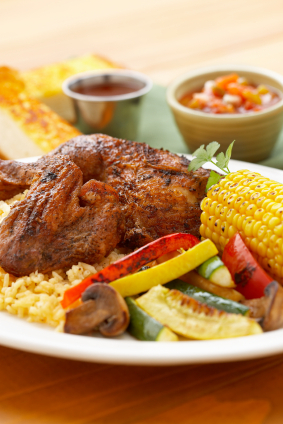 You are here: Home / Cooking / Lawry’s, Chicken, Summer, Dinnertising and YOU! I’ve been pretty quiet lately, but that’s because I’ve gone back to work. It’s been a period of adjustment, but I’m finally getting into the groove of things and working away. However, that’s not stopped me from being brain dead at times. As I thought I’d scheduled this post last Thursday, logged in tonight and it was sitting in my drafts. I’m stuck on Dinnertising! It’s the first Ad Agency dedicated to dinner and flavor! Lawry’s is working on bringing dinner back to the family table and they are doing it by hitting our taste buds, and the kids, with flavors we all will adore. You can create your own Dinnerstisement to share with the kids. It’s so much fun. Anytime I can create an advertisement with Unicorn, Kittens and Teddy Bears is a win! Lawry’s shipped me a box of their new seasonings to try out and I’m in love. I love cooking from scratch, but sometimes I need a little help in the “excitement” part, especially with me being short on time. My son is 11 now and he’s gotten to where he’ll complain if it’s “the same old thing”, so he was the perfect Dinnertising guinea pig! My grill has become my best friend of late as I can cook quickly and easily, with very little prep work. But it’s even better if my husband is working the grill! So, the combo of Dinnertising and my grill has been a great bonus in our house. My package contained the new Lawry’s Sante Fe Chili, Mediterranean Herb and White Wine Marinades and Lawry’s seasoning salts. Since it’s been warming up and we didn’t celebrate Cinco de Mayo this year, we had a late celebration here with the herbs and seasonings. It was also simple and fresh, which is important to me. And it took very little time to prepare this meal. For my chicken, I put it in a baking dish, poured over Lawry’s Sante Fe Chili with Lime and Garlic and let it marinate for 2 hours. You only have to let meats marinate for 30 minutes, but I was going for a deeper, richer flavor, but not one so strong Peanut would wrinkle his nose up. I grilled all our veggies after cutting them into strips and seasoned them with a combination of the Fire Roasted Chile & Garlic, as well as the Roasted Garlic Salt. I misted them with a little grapeseed oil from my mister, tossed them on the grill pan and in a few minutes they were done. I wrapped the corn in foil and sprinkled it with the Roasted Garlic Salt, tossed a dab of butter in and let it roast to tender perfection. The rice was steamed short grain rice that I added cumin and a small amount of the Santa Fe Chili seasoning for flavor. We served with salsa (sorry, not homemade this time) and a side of the Sante Fe Chili and Lime. It tastes as good as it looks and even better, Lawry’s is going to give you a chance to create your own Dinnertisement! There are just a few things you need to do. One, leave a comment below and share your Dinnertisement and a descriptioin of it from Lawry’s! That’s it. What will you win? See that first image at the top? 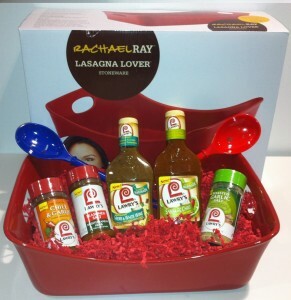 Some lucky guy or gal is going to take home a Rachel Ray Lasagna Lover Stoneware, 2 Zak Designs Serving Spoons (either happy or surprise spoons) and a full set of the Lawry’s New Marinades and Spice Blends! The winners box will contain Mediterranean Herb Seasoned Salt, Fire Roasted Garlic & Chili, Roasted Garlic Salt, Santa Fe Chili Marinade and Mediterranean Herb and White Wine Marinade. I’ll choose a winner on Saturday, June 2nd! Disclaimer: I was selected for this post by The Motherhood. I was sent a box of Lawry’s seasonings to review, as well aa stipend to shop and develop a recipe for Lawry’s and The Motherhood. http://www.dinnertising.com/Video/Details/1704?cmpid=2012-dinnertising-share-url. it is pretty fun.